What Will it Take for Michigan’s Wild Arctic Grayling to Return Home? A glittering, iridescent fish named the Arctic grayling once reigned over 20 Northern Michigan rivers. It disappeared in 1936. After nearly a century, can we bring it back? I’m looking at this black and white photograph, a view that captures the current of the Au Sable River at Grayling’s Stephan Bridge. It’s about 1900. In the foreground, the river meanders through clear-cut land dotted with logging camps. In the distance, a silhouetted stand of trees seems to push the river toward me. A few shadowy figures in riverboats float through the barren landscape. I sit a stone’s throw from where the photographer heard the sound of his shutter. Now, more than a century later, surrounded by a forest of Michigan evergreen, I’m hesitant to believe that this photo was actually captured here. 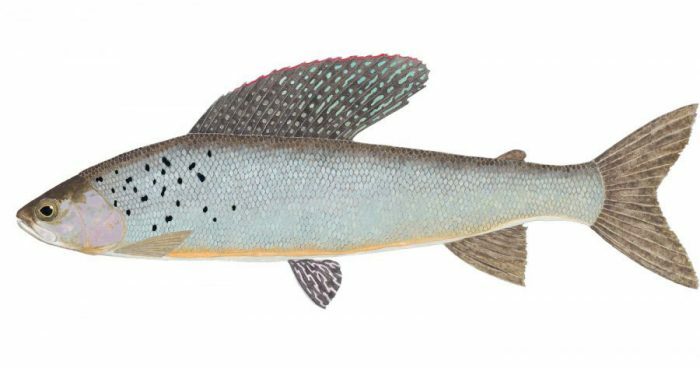 But as I admire the lush second-growth trees, I know something important is still missing from this landscape: the once-dominant fish of the Au Sable, the Arctic grayling.